No @eblasco. Me and most of my friends can not beat some 98 bases with 3 stars. It is operation of hammer fail now. I hear you tariq, but i would still like to hear from others. I been following the forums on and off and know that not everyone is here but, johnnyplumber, ken (or is it ken) , ive seen and learned from your vids, but they are mostly from bases i think I could beat. Even if im completly wrong, what is your answer to the question? Have you ever met a base you cant beat, and has it been after the update? i dont think you can beat a base with sonic, 3 hives, ion cannon, stealth generator and omega on defense 3 stars, without using an ion cannon and bonus command points and strike force.. i have found some bases can be beaten easier with strikers than drones and vice versa. yes i am sure there are plenty of bases i cant beat before and after the update.. i prefer to try winning without using the war factory and strike force. when i do hammerfall i try without any war factory add ons untill i hit the hard base, then i try with just command points and strike force.. if its really hard then i add an ion cannon and if i still cant get it i use alpha tarmacs, but since the last update, i have found strike force makes a big difference. At the middle of operation hammer I started to face level hq30 level 98 + sonic barrier + 2 Tessa towers + ion cannon + 3 armed drone hive + alpha components in all domed defenses + huge stealth tower + huge army of mk Hunters here and there. At the middle of the defence there is falcon 15 protects all of the above mentioned defense units that are fully upgraded because it is level 98. Against that I have all my omega, attack units and components fully upgraded. To beat this opponents I bought additional tactical nukes that costs 100 Gold ,add Alfa to tarmacs and command power + additional tarmac + and requested troops. That means to finish operation hammer fall I spent 600 Gold and the Gunship that I gained from it. I always face 96:98 opponents in quick matches and I can get 1 or 2 stars. In operation hammer fall I have to get 3 stars, and to do that I have to spend gold. To revive my Omega after consuming my resources to repair it, I have to spend gold every 15 minutes. That means I have to spend gold to play. For sure those players agree with the last upgrade to add powerful sonic barrier and weaken omega + combat stim are in low levels or do not have high number of medals. Or they are rich to purchase gold. I do not want to spend gold to play. There is no fun to play like that. People easily removed the game and do not care, but me and some of my friends still wish that Zynga will fix the strategic problems and return the game as it was before. We spent 2+ years with a lot of effort and money to purchase gold to upgrade. I do not agree to purchase gold to play. @Tariq i have already said in another statement that you disagreed with, that the game sux and is no longer fun, but a chore. 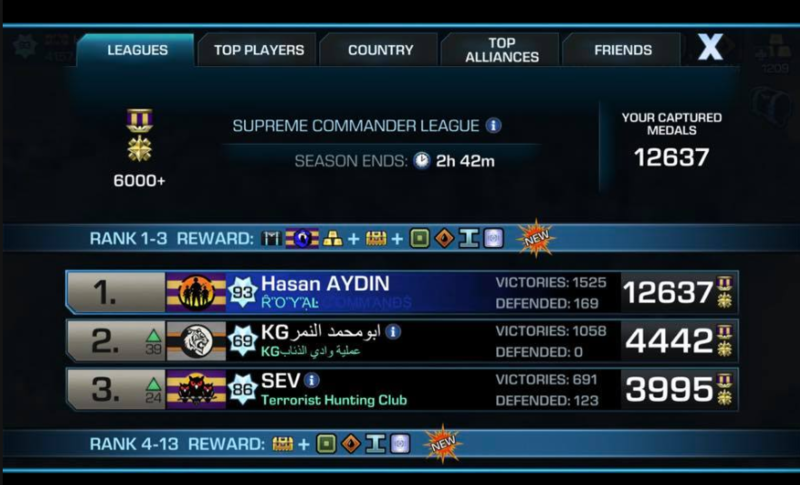 i agree the game is way too hard for most people who just want to have fun.. its very hard to win , sometimes even with strike force and alpha tarmacs , which brings me to wonder how there are players with 1000 victories , even 2000 victories in a week or even a fortnight with the current game adjustments.. unless youre getting a very very very easy quick match , doing 100 plus wars a day,paying to use strike force for 15 hours a day or "cheating" i know which one i lean toward myself. After I spent 600 Gold yesterday in Operation Hammer fall's first stage, I couldn't finish the second round.it became even harder. There is no logic for this difficulty. I spend this much of gold in extra tactical nukes. Without them,it is not possible to bass even I use alpha and strike forces. Hq hitting with drones only I think. I’ve seen some posts on Facebook. What’s next zynga? You going to weaken drones now? I’m not complaining about hq hitters by the way just that zyngas explanation for weakening combat stim on omegas was to stop hq hitters so what next? BP I know you are happy with the last updates. But me and many other friends go in discussions about Sonic Barrier and the idea of increasing the deference strength beside reducing attacking chances goes to the point that it became worst. My complaint with the sonic barrier is how the game matches opponents in Alliance Wars. My alliance has been matched 10 straight times against opponents that have six to eight lvl 80+ and 90+ bases against our four lvl 80 bases. We have no chance in these wars. Many players are talking about leaving. It has made the game UN fun. First omegas, this units ruined de game, the biggest monster wins, no strategy, no ideas just drop the monster and if is big inoff you win with or without troops. Then defenses should have a limit same as troops, it is ridiculous to have defenses level 30, troops level 30, make no sense, should put a limit for defenses like level in between 26-28 maximum, and troops the same some sould be 26 maximum other 28 maximum, it is ridiculous what the game just become. You want to add levels?? Its ok, add defenses, add troops tarmacs, but do not increase they level after a certain limit, that will make you have to do strategy to defend and attack, and yes, it will do it a little harder but not impossible like rigth now!! In few words you will be albe to win!! As I said long time ago all this this game runs on oil, no oil no game, the fun in this game is strategy, no strategy, no fun you did add omegas= no strategy, really no fun!! At that moment game went down!! A similar game Monster attack, no strategy needed you got 4 troops tarmacs a 3 monsters, biggest monster win easy, we don't want that!!! Crying players: my base can't defend, my base is hit by smalker player, way to fix it: again, add limits, if you rush your base, you will find opponents you same lavel for example if you rush your base to level 27 and all your defenses are level 5 its your problem, you should face only hq level 26-27-28 no matter what experience they have, you should no face enemies level 17 or 12 because your experience is similar. But crying baby players cry to loud and zynga prefers crying babies than ling term players so now we got ridiculous game. Then you added this ridiculous towers!! Come on really? Make defense stronger beacuse crying babies?? And not only one but 2 of them. Borring!! No strategy put your defenses under towers and you got stronger, ridiculous!! Then you got this other red tower that increase the life of defenses, ridiculous again boring!! Pem tower, actually not a bad idea and 2 towers not bad at all. But then you came with the absurd idea idea of making them teslas, and able to kill!!! Really absud and ridiculous!! ( I don't like omegas, but even a omegas can't kill it) borring!! So many defenses and no new tarmacs, no new offernsive units that can be a game changer, ridiculous!! Borring!! O wait yes a tarmacs that cost a ridiculously price of war factory components and last only 12 hrs....... Ridiculous!!! And I don't know who is in charge but sure its a dumbass in fun facts, sonic barrier, ridiculous!! Stupid, frustrating, borring.... And many more. I usually play to kill my stress, or to kill time my so afeter hq 26 i decided to quit, it eas no so bad but omegas ruined the game, it just got borring!! I gave it a second chance, and came back played for a while got into hq28, after a while got borring, too many defenses defensive towers, i did decide ti wuit again, it was not that bad, but it was not the type of game i like, with strategy, fin it was just borring, after i decided yo came back just to see new levels, ok my hq level 30, exp 88, got so ridiculous, so frustrating, so stupid the game, that I am quiting this time for sure, no come back and installing this game in my phone and tablets, yes tablets, 3 of them. I will ask service to erase all my accounts!! 20 of my Friends in my alliance that are level 27-30 they told me they are quiting definitely, I tod them me too let's find a new game!! By the way, got 4 years playing this game since day 1 it came out, now I fill like a waste of time. See ya!! Never be back again!! If there are cheats to win thousands of medals, Zynga should fix that with a way that should not affect other players that want to get fun by playing a real strategy game. Again I repeat that we can get fun to lose if there is a hope to win 3 stars or to learn some new strategy. Now there is no fun because almost one month now with no win, no real offence strategy. It even became more stupid with that easy defence. There is no defence strategy also. Just fill your base with monester towers, put all your defences in one area and no one can touch them. If you try to win one star you will lose all your resources. Operation Hammer fall requires 3 stars to pass. Jumpers reached level 98 in few days and fill them defences with Alfa and others using war factory components that they gained from war train. Still I don't want to quit and waiting for Zynga to fix them mistake. Apologies for the inconvenience, Commanders. Rest assured that your feedback will be relayed to the team. Thank you for your patience and understanding. As one response to this topic, everyone has the same chance or opportunity. If you're will to spend the same amount of $$ on the game it's fair.. I just did another troop BOOSTED test and sure, more 3 flag victories, the game is fun.. The moment my boosted troop time expired, defeat after defeat in quick matches and forget about any success to complete hammerfall with no boosts. Now the game blows again. Am I willing to spend $$ to win? I use to blow huge amounts of $$ on this game, then stopped. What happened was, whenever I had stockpile of gold, there seemed to be an intentional lag built into the game, so when I hit to OK to remove a tree for example, nothing happened, so as soon as I hit remove tree again, it switched to use gold and took multiple thousands in gold on a few occasions. So I inquired with the help guys, they said there is a "are you sure" message before gold is deducted from your account. Not always will that message pop up. After this continued to happen over and over, I started getting the daily drops and never spent 5000 in gold to remove a tree again! Now, I purchase the daily gold drop, which kept either my defense or offense boosted most of the month, but not anymore. The Sonic Barrier takes most of my gold now. So, I'd rather not play or play for free and lose often..
Viper... Before the sonic barrier, a Viper alone use to almost destroy my entire base, as in the Viper is way too strong, but I missed the boat upgrading mine, in hopes the next bot was better! Anyway, with the Sonic Barrier, Viper still does the best from the rest.. The Sonic Barrier, I'm fine with it.. I just won't pay more than I do now to boost. Before, I purchased the ION Cannon, then troop boosts, and defensive building boosts. Grant it, the Sonic Barrier almost defends the base on it's own, but I'm using up my gold so much faster now and I completely stopped boosting defensive buildings. As I said on a previous post, I whined about race wars and wars ending in ties. Which rarely happens now, so the Sonic Barrier fixed one problem, but caused another. Which is, people don't want to pay to win. I went all tarmacs boosted the last couple of days beating upper 90s. And had some problems against fully boosted HQ30s low 80s. Troop boost expired and couldn't get 3 flags off the following 10 quick match attempts, so I stopped playing for the day and still have about 12 hours left on all tarmacs instant training boosts. I think the game is actual better now, but I have no desire to pay to win. Before the Sonic Barrier, if I played completely for free, I/we would win often. Now, no pay, no win, no fun. There is no fun now, and no i will not pay to win 3 stars, i will not pay to have fun, to be honest i have lost all the fun for this game and i do play this for a long time now, more than 3 years, i am lvl 98 and its impossible to win on bases that are with full boost´s, for me its the end, to much stress now, stress that i dont need in my life lol i play to have fun thing that i dont have now. Zynga should reduce the diameter of the Sonic Barriers to protect only one building and reduce its strength as soon as possible if they do not want to eliminate it at all. It is the same way they reduced the Combat Stim strength and weakened the attacking units. I believe that it is a challenge for Zynga to develop this quickly before they lose more fans and E&A becomes a past from the history because it becomes worst at defence and attack. Only on strategy for defence to put all your buildings around the Sonic Barrier. And only one strategy for attack is to lose your resources and all your units. Hi guys, for me Zynga has killed the game with the latest update. Even with my lvl 87 hq 30 with maxed out strikers and maxed out Viper it is virtually impossible to defeat any base with active sonic barrier and tesla coils. I basically only get lvls 85+ bases in quick battles that also have active stealth so that means a certain defeat. What’s your opinion? bit more balanced so that you would also stand a chance with the other omega’s. I can win 3 stars with SF against Sonic Barrier but I can’t win 2 stars without SF against SB. Yes Zynga have finally killed this game. 3 years and 3 months wasted..... Not to mention the dollars spent. Cya! Agreed, it has become a falcon drone game. Not much fun if you like to play with ground troops. sorry mate.. not that zynga cares . but hitech has been my longest serving friend in this game. weve both seen many changes, all until now were rectified and adjusted to suit ALL player levels and abilities and being sure to enable EVERY player the opportunity to play enjoyably without using the war factory or money. but now you cant play without it , only to satisfy those a nal about their base defending itself,and zynga plays tight azz with components in the normal game play (pvp) (quick match) , this is a game for fun, not frustration and boredom.